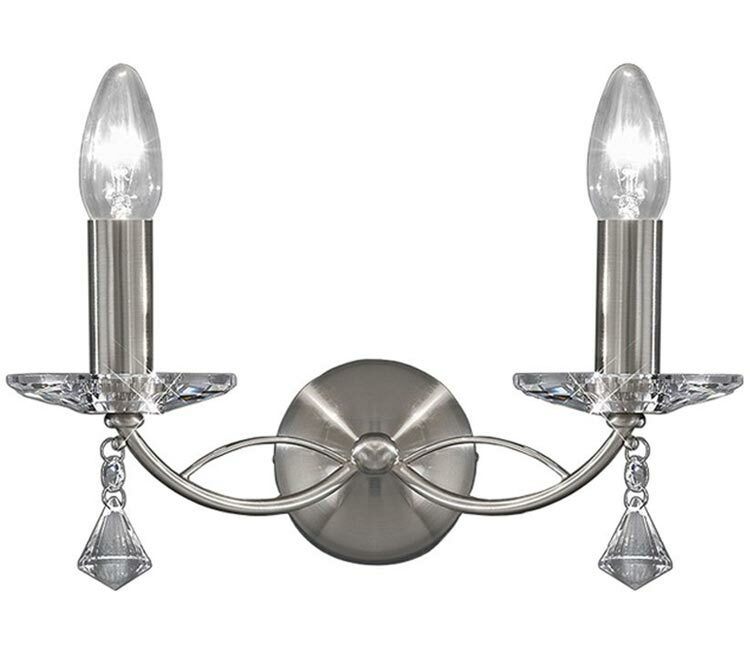 This Franklite Monaco 2 light twin wall light in satin nickel finish with crystal sconces and drops is modern, stylish and bright. Circular 9cm diameter wall mount, chain suspension and two elegant braced arms, crystal sconce’s and matching candle tubes complete the design. The base of each sconce is decorated with a heavy faceted drop for extra decoration. Please note that this wall light is not switched. Ideal for your bedroom, hallway, dining room or living room wall. A class II double insulated wall light no earth required and suitable for older properties without an earth loop. There are matching fittings in the Monaco satin nickel finish lighting range that includes three, five and eight light dual mount ceiling fittings, please see below. Also available finished in matt gold and bronze, please use the search bar at the top of this page to view the complete collection. This stylish light is supplied by Franklite Lighting who have been one of the pioneers in the design, manufacture and distribution of high quality lighting such as the Monaco 2 light twin wall light in satin nickel finish with crystal sconces and drops you see here.